Per la prima volta in assoluto nel nostro secolo, quest’anno Channukkah e Thanksgiving cadranno nello stesso giorno, il 28 Novembre. L’ultima volta che questo è accaduto è stato nel 1888 e non succederà per altri 77798 anni, fino al 79811. Questa sovrapposizione bizzarra si ha perchè che il giorno del Ringraziamento sembra essere stranamente tardi quest’anno, e Channukkah assurdamente presto. Così, per una strana coincidenza astrale, è nata la crasi (discutibile, ma buffa!) di Thanksgivukkah. Sono molto entusiasta di questa strana festa, che non vedo l’ora di celebrare: ho sempre amato e un po’ invidiato lo spirito del Thanksgiving americano, che qui in Italia non esiste, e ora ho una scusa ufficiale per partecipare ai festeggiamenti! 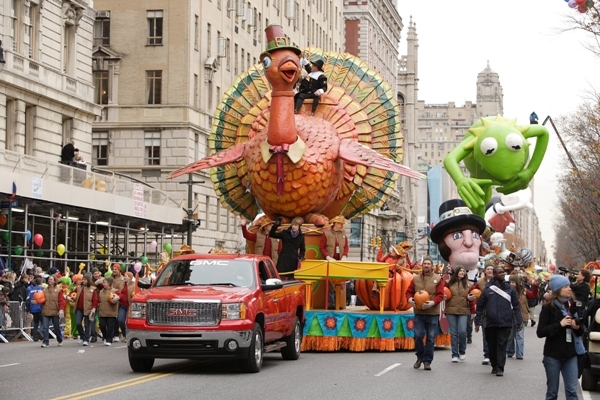 Riunioni di famiglia, buon cibo, la Thanksgiving Day Parade di Macy … non è tutto incredibilmente eccitante? Inoltre, Thankgiving non è come Natale, che se sei ebreo ma vorresti festeggiare finisci per sentirti in colpa: questa festa è di tutti, senza distinzione di origine etnica, cultura o religione. L’obiettivo è semplice: stare insieme, condividendo un magnifico pasto, con un cuore grato e riconoscente. Come dicono gli inglesi, what’s not to love? Forse il Thanksgiving mi piace così tanto perché commemora una storia bella, di accoglienza e inclusività, un’idea – questa – che sta particolarmente a cuore al popolo ebraico, che si è spesso trovato ad aver bisogno di accoglienza, in ogni angolo del mondo. Non so se sia così, ma anche questa mi sembra un’ottima ragione per festeggiare. Bando alle ciance filosofiche: come possono ebrei e gentili celebrare questa nuova, emozionante doppia festa? Beh, con tanto buon cibo, come sempre! Qui entra in scena Stef, del blog Cupcake Project, che ha avuto una brillante idea: iniziare un “Thanksgivukkah blogger potluck” per raccogliere ricette dedicate a questa festa. Io, prevedibilmente, non ho resistito alla tentazione di partecipare, così ho preparato per l’occasione una deliziosa challah alla zucca, che ora vi racconto. 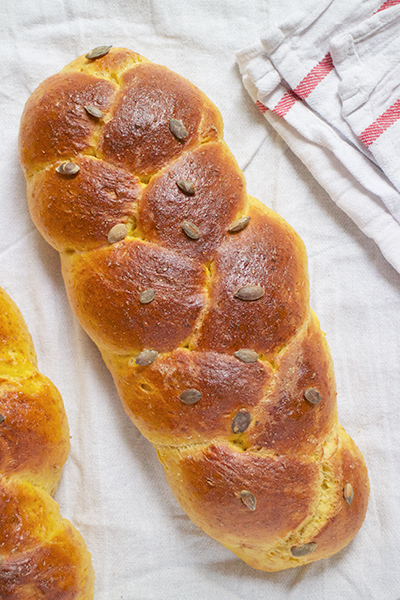 Ho usato, con qualche minima modifica, la ricetta della pumpkin challah di Tori del blog The Shiksa in the Kitchen, che vi consiglio di scoprire se ancora non lo conoscete e vi interessa la cucina ebraica. 1 kg di farina approx. Sciogliete in una ciotola capiente il lievito con l’acqua tiepida (non bollente!) e il primo cucchiaio di zucchero bianco, poi fate riposare un paio di minuti per riattivare il lievito, specie se usate quello secco in granelli invece di quello fresco indicato nella ricetta. Aggiungete nella ciotola il resto dello zucchero, l’olio, il sale, le uova, il miele, la purea di zucca e le spezie, dunque amalgamate il tutto; aggiungete poi anche la farina, ma lentamente, due bicchieri per volta, perchè non è detto che vorremo usarla tutta: ne useremo circa 1 kg, ma magari anche un po’ meno, a seconda delle condizioni climatiche e di molti altri fattori imprevedibili. Quando l’impasto diventa compatto e non si attacca più alle mani lavoratelo bene su un piano infarinato per una decina di minuti, poi trasferitelo in una ciotola leggermente unta e fatelo lievitare per almeno un’ora coperto da un panno umido, finchè non raddoppia. Trascorsa un'ora, schiacciate l'impasto per far fuoriuscire l'aria e rimettetelo a lievitare, per ancora un'oretta. Una volta che l’impasto è ben lievitato fate le forme (e se fate l’hafrashat – dico alle lettrici ebree! – ricordatevi di prelevare la parte di impasto necessaria prima di intrecciare): la treccia semplice di tre rotoli, come quella dei capelli, è facilmente realizzabile e di sicuro effetto, e con questo impasto se ne ottengono 4. Disponete le trecce di impasto su teglie ricoperte di carta da forno e fate lievitare il tutto ancora mezz’ora; intanto preriscaldate il forno a 180°/200°. A lievitazione ultimata, spennellate le challot con dell'uovo sbattuto diluito in un po’ d’acqua e cospargetele di semi di sesamo o papavero o di zucca, poi infornatele nel forno già caldo. Fate cuocere le challot per circa mezz'ora, girando la teglia a metà cottura perchè cuociano in modo uniforme. Il tempo di cottura dipende dal forno, ma si nota subito se la challah è cotta: acquista in superficie un bel colore, tra il marrone e il dorato, sprigionando un profumino che richiamerebbe anche la più sbadata delle cuoche. Fate raffreddare bene le challot sulla teglia prima di servirle. Ora, se l’idea di celebrare Thanksgivukkah un po’ vi stuzzica, vi consiglio di curiosare tra tutte le deliziose ricette incluse nel nostro Thanksgivukkah blogger potluck: ci sono abbastanza idee non solo per la cena di Thanksgivukkah, ma anche per tutte le 7 sere di Channukkah! For the first time ever, this year Channukkah and Thanksgiving will fall on the same day, November 28th; actually, to be precise, the first full day of Hanukkah falls on Thanksgiving day). The last time this happened was in 1888, and it will not happen again for another 77,798 years, until 79811. The cause for this freakish overlap is that Thanksgiving happens to be oddly late this year, and Channukkah is absurdly early. Thus, the questionable portmanteau of Thanksgivukkah is born. I’m pretty excited about this weird celebration: I’ve always loved the spirit of Thanksgiving and wished we had something like it here in Italy, where this particular holiday is only celebrated by American expats; now I have an official excuse to join the celebrations! Family get-togethers, good food, Macy’s Thanksgiving Day Parade… isn’t it incredibly exciting? Plus, there’s no need to feel guilty if you’re Jewish and celebrating, like for instance on Christmas, because this holiday is for everyone and every American is involved in this, no matter their ethnic background, culture or religion. The primary focus is enjoying each others company, while sharing a magnificent meal with a grateful and thankful heart. Perhaps I like it so much because it commemorates how newcomers were first welcomed to America, a tradition of inclusiveness that is particularly dear to the Jewish people, who have often been immigrants to foreign countries. But how might Jews and gentiles celebrate this twin holiday? Well, first as always is the food. Stef, from Cupcake Project, had a brilliant idea on the topic: starting a Thanksgivukkah blogger potluck to gather yummy recipes for this very special holiday. I really couldn’t resist the temptation to partecipate, so I baked a delish pumpkin challah to join the party. I’ve used, with minor tweaking, a pumpkin challah recipe by Tori from the blog “The Shiksa in the Kitchen”. Pour ½ cup of the lukewarm water into a large mixing bowl, add 2 packets of active dry yeast and 1 tbsp of sugar to the bowl, stir to dissolve and wait 10 minutes. The yeast should have activated, meaning it will look expanded and foamy. Once your yeast has activated, add remaining ½ cup lukewarm water to the bowl along with the rest of the sugar, egg, egg yolk, honey, vegetable oil, salt and spices, and use a whisk to thoroughly blend the ingredients together. Whisk in the brown sugar and pumpkin puree to form a thick liquid. Grease a bowl with oil and push the dough into it, then flip it over so that both sides are slightly moistened by the oil. Cover the bowl with a clean, damp kitchen towel. Place the bowl of dough somewhere warm to make the dough rise for 1 hour. Take the dough bowl out and punch it down several times to remove air pockets. Place it back inside the oven and let it rise for 1 hour longer. Take the dough out of the oven and flour a smooth surface like a cutting board, then turn the dough out onto the floured surface and knead for a few minutes. Now your dough is ready to braid. If you plan to separate and bless the challah, do it prior to braiding. After you’ve braided your challah loaves, place them on two separate cookie sheets lined with parchment paper and brush them with egg wash.
Preheat the oven to 350 degrees F, meantime let the braids rise 30 to 45 minutes longer. The challah will need to bake for about 30 minutes total. Turning the tray during the baking time helps your challah brown evenly. Once the challah is browned to your liking, take the challah out of the oven. You can test the bread for doneness by turning it over and tapping on the bottom of the loaf—if it makes a hollow sound, it’s done. Let challah cool on the baking sheet or a wire cooling rack before serving. Stento a credere a tutta la bontà presente su un tavolo che celebra entrambe festività! Già il solo Thanksgiving è un overload di cibo! L’idea del Thanksgivukkah è bellissima. Happy Thanksgiving and Channukkah 2013! PS love your pumpkin challah! Ciao carissima, forse te l’ho già chiesto: ma é kasher per fare Hamotzì questa challà? Non diventa per caso Mezonot? the taste is noticible. There is another similar rule with mei peirot (which includes eggs), and there too the bread becomes mezonot if the taste is noticible. On this point, the Rema rules that the bread only becomes mezonot if the majority of the liquid ingredients are mei peirot. Premesso che non sono un’autorità in materia, la norma mi pare molto opinabile e relativa. A questa norma si deve tra l’altro aggiungere che è ritenuto genericamente mezonot ciò che viene mangiato come “snack”, mentre ciò che si mangia in quantità maggiori e accompagna il pasto è comunque hamotzi (leggasi qui). Per questo direi che mi impegno comunque a verificare, ma sono abbastanza ottimista. Is there a way to translate to english? :) However I do love pumpkin challah! Beautiful post and beautiful challah! I’ve been wanting to make a pumpkin challah for quite a long time, but couldn’t settle on a recipe. I think I’ll try this one. Thank you! Beautiful Challah and such a great idea! Your pumpkin challah looks wonderful, and now you’ve got the wheels turning in my brain. I make a Finnish braided bread spiced with cardamom, called ‘pulla’. I used cardamom with pumpkin in my kugel. What if I were to use cardamom in your pumpkin challah? It would be a Thanksgiving-Hanukkah-Finnish bread, and may just cause the universe to explode. ero passata appena pubblicato il post, ma evidentemente non ho inviato correttamente il commento! Comunque.. non sai la gioia nel leggerti (lo faccio sempre.. sempre.. amo la “vostra” cucina, tanto da essere protagonista più della tipica italiana in casa mia.. le tue ricette ormai le ho copiate tutte ;-)!).. aggiungi pathos ed entusiasmo ad un viaggio che sto per fare.. il 26 parto proprio per Israele, ed il 28 sarò a Gerusalemme.. potrò vedere da vicino questa festa, assaporarne tutti i profumi spandersi in città.. viverne le emozioni che, so già, saranno valanghe a travolgermi..
ps.. questo pane? finisce subito nel “to do.. as soon as possible”.. la zucca c’è! bacio e … complimenti sempre! ps. se hai qualche dritta su posticini dove andar a scoprire le meraviglie della cucina, fammi sapere ;-) (vedrò Gerusalemme, Tel Aviv, Nazareth.. come principali città ;-)! tutte le ricette sono davvero superlative!! bella, bravi! proverò di certo e seguirò il consiglio di bloglettura. il mio mestoloecalamaio.it (parlar di cucina e cucinare parole) è appena nato e ha ancora tanto da imparare! Grazie per la ricetta e grazie, come sempre, per le tue belle e interessanti riflessioni su Thanksgiving, inclusività e cultura ebraica. Queste pagine sono molto più che un blog di cucina.